Cathy Alban, Linda Bradley, Deborah Bryant, Gloria Contreaus, Julie Daines, Diana Diou, Jean Duynslager, Celeste Eastman, Jean Hewitt, Barb Hunsinger and Kathi Krieg. In the Crystal Ballroom, the Quail Creek Education Committee and TWOQC Scholarship Committee will co-sponsor the second Kino Lecture “Arizona Jaguars: A Future in Limbo”. Randy Serraglio, Tucson Center for Biological Diversity, will share photographs and discuss the history of AZ jaguars, their present plight and what must be done to ensure their survival. Tickets ($5) will be available today (8:00 – 4:00) and Saturday (9:00 – 12:00 noon) at the Concierge Desk, checks only made payable to TWOQC Charity Account or at the door Monday evening (cash or check). All profits go to TWOQC’s Scholarship Fund. “Love You to the Moon and Back” happening May 19th! The decorated donation box has been placed in the Madera Clubhouse! Please tell all your friends and neighbors. We are looking for donations of diapers (up to size 4), outfits or onesies (sizes NB-18 mos), blankets, hooded baby bath towels, baby wash, baby powder, pacifiers, etc. Additional box is at Kathi Krieg’s porch, 2680 E Sawyer Road. We’re off to a great start with 16 moms already signed up for the Baby Shower. Our next meeting is Wed., January 17th, at 10:00 a.m. in the Kino Conference room. Anyone wishing to help us, please join us at the meeting. Any questions, please call Kathi Krieg at 209-402-7606. We are looking for more items for baskets. Donations such as coffee, wine, chocolate, snacks, pet supplies, garden supplies, golf items, spa items, and pasta items are needed so we will be able to add those items to baskets. Individual baskets, craft items, paintings and jewelry are also appreciated. Contact Ginny Hutcheson at 520-495-4027. Nancy Jacobs will be selling luncheon tickets on January 19th and 22nd from 4:30 to 7:00 p.m. at Madera Clubhouse lobby. If there are tickets left, an additional sale will be at the January 29th TWOQC meeting. Linda Bradley will be selling 50/50 and raffle basket tickets on the 15th, 19th and 22nd from 4:30-7:00 at the clubhouse and again on January 29th at TWOQC meeting at 10:00 a.m. Right now the 50/50 raffle already has over $1,000 in the pot! Table sponsorships are being offered for $100, $150 and $250. The Sponsor Commitment form is accessible online at TWOQC’s website or in the Touched By Cancer slot at the clubhouse. Youth On Their Own is always in need of items for their pantry and mini-mall. A table will be available at the back of each TWOQC monthly program to receive mini-mall donations. Please consider contributing canned goods (vegetables, fruits, tomato products and chili), peanut butter, pasta or mac and cheese mixes. Students also need full-sized shampoos, conditioners, soaps and deodorants. If you are an Arizona resident you can still make a contribution to YOTO that can be used for a dollar-for-dollar tax credit against your 2017 tax liability. For more information consult yoto.org. 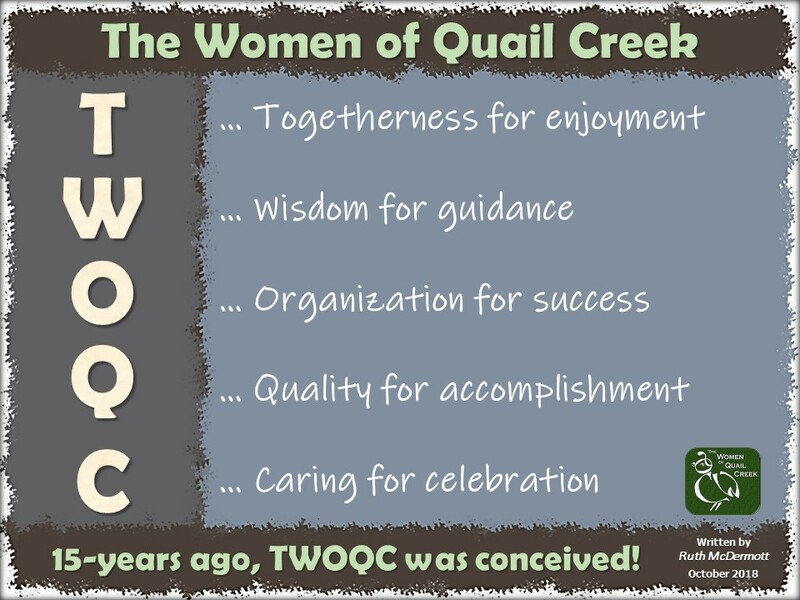 Consider mentioning TWOQC in the memo area of your check so YOTO knows how much we are helping support their goals. At the present time we are in need of a chairperson for the VA Clothing Drive scheduled for this October. There is an experienced committee set up and working behind the scenes, but we need someone to lead us! Please contact Laura Colbert (520-625-4033) or Angie Werner (402-309-5467) to volunteer for this position. “Thank you” to this week’s FMM contributors: Laura Colbert, Kathi Krieg, Diane Quinn, Carol Shelton, Angie Werner, and Julie Woodward.